PM Narendra Modi visits United Kingdom on 12-13 November to bring out investment in India and bolster the relationship with UK. This visit has been important in aspects of bringing investment and counter the opposition in home country. PM Modi also addresses the diaspora in UK and signed various agreement and vision statement also been issued by UK-India. PM Narendra Modi and PM David Cameroon met and emphasized on the better relationship and safeguarding and promoting the prosperity of both the countries. The two Prime Ministers endorsed a "Vision Statement” setting out the fundamental principles on which the UK-India partnership is built, and outlining a road-map for deepening co-operation. They resolved to hold biennial PM-level summits to advance the partnership. The UK and India share interest in stability and prosperity across Asia and Indian Ocean. Hence, the two heads agree upon extending and deepening the bilateral consultation and cooperation in these area through the establishment of an annual senior official South Asia dialogue. Both heads also emphasized on lasting and inclusive constitutional settlements in Nepal and promote political stability in the region. They also stressed on enhancing cooperation for counter-terrorism and reiterated their call for Pakistan to bring the perpetrators of the November 2008 terrorist attack in Mumbai to justice. Both agreed upon bringing stability and prosperity in Afghanistan necessary for the South-East Asia region. The two Prime Minsters noted the importance of preserving the wildlife and curb the illegal trade. They agreed upon combat the illegal wildlife trade and protect the captive and wild Asian Elephants. India also endorsed the London Declaration and Kasane Statement on Illegal Wildlife Trade. UK is the largest investor of G20 nations in India and committed to foster the economic development and more investment in India. The Two Prime Minsters agreed that City of London should also invest in infrastructure of India including in the railway sector laying the foundation of long-term economic partnership and help India in its rapid growth. they also welcomed the announcements by HDFC, Bharti Airtel, State Bank of India and Yes Bank to raise finance through the City of London which also opens up the opportunity for the Indian private sector to raise capital for their investment and growth. PM David Cameroon welcomed the initiative "Make in India" and whereas, PM Narendra Modi promised the commitment of making India investment friendly and Ease of doing Business. Both PM welcomed the initiatives taken in defense sector, technical cooperation in railways and industrial cooperation. Under Smart City projects, Both PM announced UK-India partnership in the development of cities- Indore, Pune, Amaravati with urban and technical expertise. The two PM also launched the Thames-Ganga partnership for healthy river system that will consists of collaborative research and innovative programs to manage the water resources of Ganga basin. Indian government eases the FDI limit in insurance sector to 49% which will help inflow of 238 million pounds FDI in India. UK has also pledged to support Skill India. 11 UK companies are ready to provide basic training to the youth and start "Center of Excellence" in various sectors with starting a Automative and Advanced Engineering in Pune. The two PM agreed on partnership at school level which enable children to experience education system of each other. Both also marked the UK-India year 2016 as Education, Reasearch, and Innovation. The Department of Science and Technology (DST) and the Global Innovation and Technology Alliance (GITA), of the opening of a third round of collaborative industrial R&D, making up to £3.5 million available to support novel commercial solutions in the areas of clean-tech energy, affordable healthcare and ICT related to clean-tech energy and healthcare. The two Leaders welcomed UK’s plans to send 100 academics to India over the next two academic years as part of the Global Initiative for Academics Network (GIAN); and the ambition for 25,000 UK students to come to India through the Generation UK-India programme by 2020, including 1000 UK interns with Tata Consultancy Services in India by 2020. The PMs also noted that UK would be partner country in Technology summit 2016 in Delhi. The two leaders affirmed their vision of a forward-looking partnership between the UK and India that would play an indispensable role in creating economic growth, jobs and security for the people of both countries. They reaffirmed their commitment to working together to build such an enhanced and transformative partnership for the betterment of their two countries and the world. 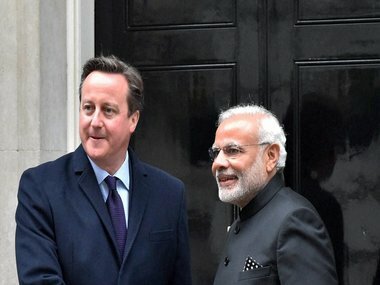 Comments "Outcomes of UK visit of Prime Minister Narendra Modi"